It happens over and over again. A foreign shipment arrives in some U.S. sea or airport. Only a tiny portion of the cargo can be inspected. 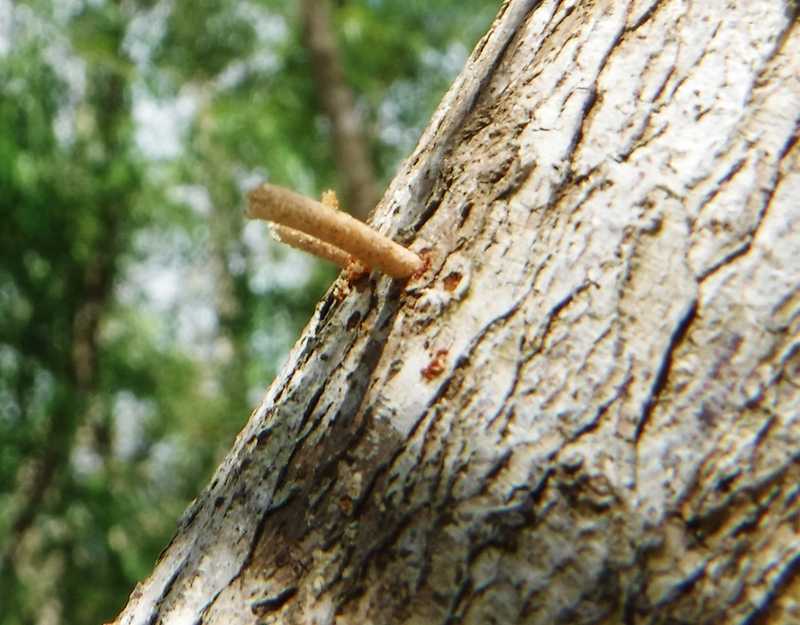 Unnoticed, hitch-hiking in the wooden packing material of something as innocuous as kitchen tiles, may be a non-native insect’s eggs or larvae. The tiles and infested wood quickly move through the distribution chain, and the insects freed from their native controls and with plentiful hosts, rapidly multiply. Another invasive species has arrived that will probably remain undetected until it’s too late and out of control. In this horde of invaders are numerous species of bark beetles belonging to the weevil subfamily Scolytidae. 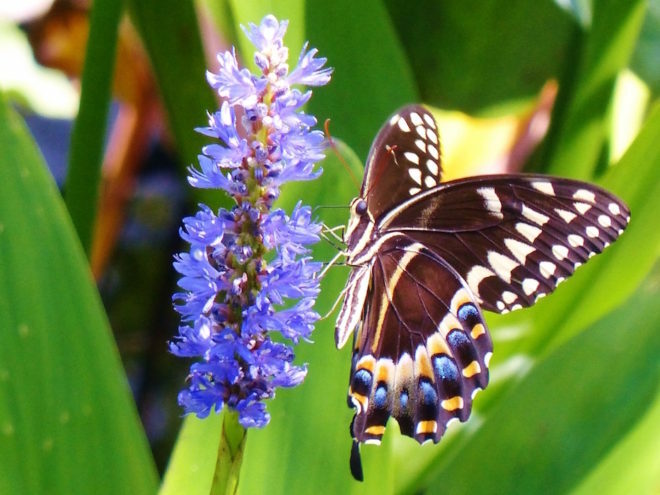 Over 55 different exotic scolytids species have now established themselves in the USA. Among their ranks are some of the most damaging insects our North American forests. In western United States alone, aided by shifts in temperature and increased water stress from climate change, they are felling as many as 100,000 trees a day. Here in the Fakahatchee you’ve probably noticed rust-colored dry leaves suddenly appearing in many of our hardwood hammocks. These are redbay trees (Persea borbonia) that have succumbed to laurel wilt. The disease is vectored by a tiny bark-boring beetle, the redbay ambrosia (Xyleborus glabratus) which arrived on wooden pallets from Asia in Georgia in 2002.Here in the Fakahatchee you’ve probably increasingly noticed sprays of rust-colored dry leaves poking through the canopies of many of our hardwood hammocks. These are red bay trees (Persea borbonia) that have succumbed to laurel wilt. The disease is vectored by the tiny bark-boring, redbay ambrosia beetle (Xyleborus glabratus), which arrived from Asia on wooden pallets in Georgia in 2002. Most ambrosia beetle species only attack dead and dying trees and can actually be considered beneficial to forest ecosystems as they speed the recycling of nutrients. The redbay ambrosia beetle, however, attacks healthy trees. These are in the Laurel family and include avocado, sassafras, spicebush, swamp-bay and of course redbay. The beetle has a symbiotic relationship with a pathogenic fungus (Raffaelea lauricola) whose spores it transports in special pockets in its mandibles. When it initially attacks, the redbay ambrosia beetle bores through the tree’s trunk without ingesting the wood tissue, leaving behind telltale frass in the form of a sawdust straw on the outer bark. The beetle doesn’t create galleries directly below the bark like most bark borers, but heads straight for the sapwood where it injects its symbiont’s spores into the vascular system, effectively farming it. The growing fungus leaves a streaky black discoloration in the xylem. This is the ‘ambrosia’ upon which both the adults and larvae feed. Most of the life cycle takes place within the galleries, where beetles mate and lay eggs. It takes about 30 days to develop from egg to adult. As the next generation of female beetles matures, they collect fungal spores to carry to another hapless tree. It is thought females can fly 2-3 km in search of a host, whereas the males are flightless. The fungus quickly spreads throughout the tree’s vascular system clogging it and depriving the tree of water. The tree wilts and dies within a few weeks of initial infection. 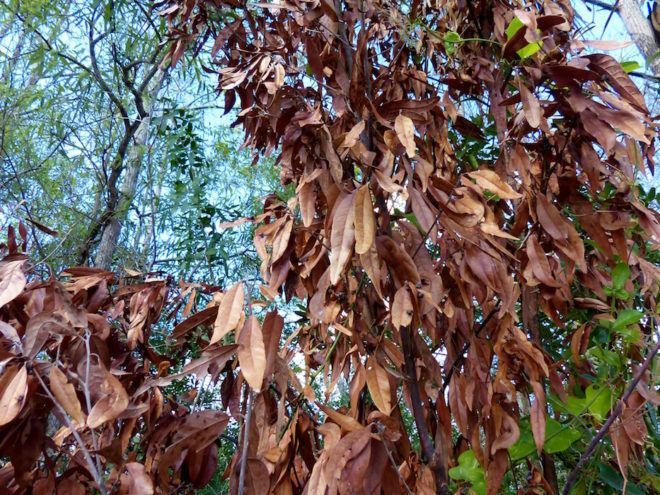 It happens so fast the tree doesn’t even have time to form abscisic acid, the usual reaction to severe stress that causes leaf loss, hence the characteristic brown dried leaves that persist well after the tree is dead. Because our bays evolved on the opposite side of the world from this disease, they haven’t had an opportunity to develop resistance. So far there’s nothing we can do to stop this plague other than monitoring it and avoiding transporting dead wood. 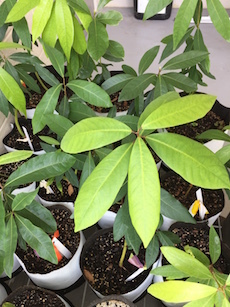 During a field trip to Naples Botanical Garden, however, my wife’s 4th grade class members were involved in transplanting and tagging bay tree seedling into specialized air-pots. (Photo of healthy redbay plants by Chad Washburn.) The Garden has been working with several local conservation organizations to collect bay tree seeds that they have been growing indoors. The idea is to preserve a pool of the tree’s genetic diversity. They currently have about 150 plants. Chad Washburn, the Garden’s Deputy Director shared an interesting thought. Since juvenile bay trees don’t seem to be susceptible to the ambrosia beetle, Chad is considering experimentally coppicing healthy bay trees to protect them, i.e. cutting them right down to the ground so they will re-sprout. Hopefully this can buy time while a long term solution is sought, or at least allow the bell curve of the epidemic to peak. Other strategies involve chipping infected wood. The fungus dies within a couple of days of chipping but can persist in a standing tree for at least a year. Chipping also disrupts the beetle’s life cycle. Unfortunately this is not practical on an ecosystem scale. However the damage doesn’t stop with the trees’ demise. Apart from losing a valuable shade tree in our hammocks, there is a knock-on effect in the food web. White-tailed deer forage on new bay leaves; black bear, and wild turkey and other birds feed on the redbay’s fruit. But most serious of all, our redbays are the major host plant for two of our swallowtail butterfly species; the palamedes (Papilio Palamedes) and the spicebush (Papilio troilus). If the redbays, go so may they. If this was not enough, there’s an even more menacing invader looming over the horizon. It’s the emerald ash borer (Agrilus planipennis). Although not a scolytid, it’s also a native of Asia that probably arrived on wooden packing material. In common with many invasive species, in its native range it’s not a significant pest. But here in North America it is decimating our native ash trees, threatening the entire Fraxinus genus. It hasn’t reached Florida yet, but on November 8, 2016, the Emerald Ash Borer was confirmed in neighboring Alabama. Alabama’s quarantine will slow, but probably not stop the emerald ash borer’s spread. Unfortunately, 85% of our iconic ghost orchids grow on pop ash trees (Fraxinus caroliniana). Globalization is a real threat to biodiversity.